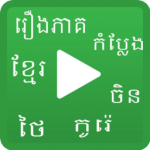 u young Khmer people’s have downloaded lots movie, I wandered how do I sign up to watch. On the top right, you see Login. Click on it. Then at the bottom, you see Register. Click on it. Admin will review and hopefully approve within 24hrs then u can watch all movies. Why ‘s every movies I went to keep saying Video is currently not available and want me to try again in a few hours but actually they ‘re never work ,does n’t how many time I try . Have you registered yet, Chan dear. If you have already registered, will please provide us with your user name? if not, please do register ..